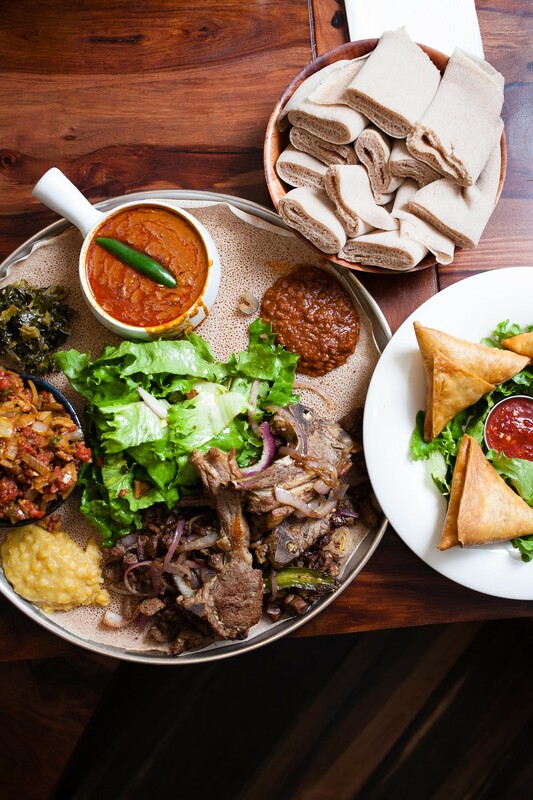 Enssaro has the kitchen chops to merit its status as one of the most popular Ethiopian restaurants in town. Nesanet Tamirue (center) shares a meal at Enssaro with several family members. Hours: Sun.–Mon., Wed.–Thu. 11:30 a.m.–10 p.m.; Fri.–Sat. 11:30 a.m.–11 p.m.
For the better part of the last ten years, Enssaro occupied a tiny, inconspicuous storefront in Oakland's Adams Point neighborhood. 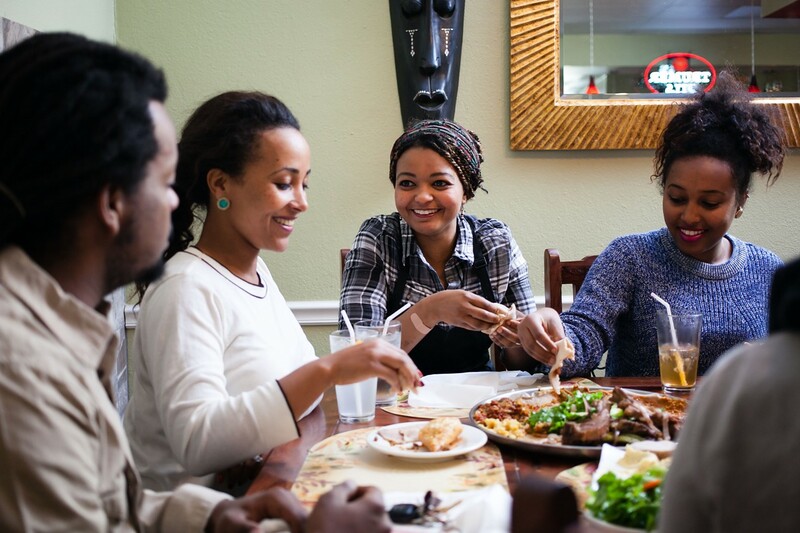 But while many of Oakland's other Ethiopian eateries have labored in obscurity, or mostly catered to the city's sizable East African immigrant community, Enssaro's tiny dining room was consistently packed — with some Ethiopian expats, yes, but also with a cross-section of the city's young and hip crowd. Drive past almost any night of the week — but especially on First Fridays, with Uptown's hub of art galleries and other assorted happenings just a short walk away — and you'd see a throng of tattooed and skinny-jeaned folk on the sidewalk waiting for a table. Is there an Ethiopian restaurant in the East Bay that has a larger mainstream following, especially among non-Ethiopians? Cafe Colucci is probably the only other contender. So when Enssaro moved to a larger location across the street two months ago, it seemed like a good time to reinvestigate the source of its popularity. Like many small, homegrown businesses, Enssaro wasn't an immediate hit when it first opened in 2006, explained Nesanet Tamirue, who runs the restaurant along with her brother Solomon and mother Zenebech — the latter of whom is head chef. The Great Recession hit right after that, and for a few years the restaurant built a small but faithful following. More recently, though, Enssaro has become, arguably, the most popular restaurant in Adams Point. While the new location has doubled the restaurant's seating capacity, the chance of snagging a table during prime weekend dinner hours remains difficult, especially since Enssaro doesn't take reservations. The new restaurant doesn't bother with any of the outward trappings of the traditional Ethiopian eatery. There are no colorful mesob wicker baskets here, no low-slung dining stools. With its largely white clientele (at least during my visits) and prominent bar section backlit with neon beer signs, the restaurant's new digs could probably pass for, say, a Gordon Biersch brewpub — the unobtrusive African artwork on the walls notwithstanding. The large crowds, however, did seem to make the serving staff a bit absent-minded. Water glasses were left empty for long stretches, and on one occasion it took so long for anyone to check on our table that I decided not to bother asking why one of our entrées came with a different side vegetable than what we'd been promised. It wasn't, in my experience, the kind of place where you can expect to get detailed explanations of what goes into a dish or how it's prepared. Still, what Enssaro lacks in terms of polish and ambience, it mostly makes up for in the quality of the food itself. One of the defining characteristics of Ethiopian cuisine is its abundance of vegetarian options, which is due in part to the fact that adherents to the Ethiopian Orthodox Church don't eat meat for nearly half the calendar year. It isn't surprising, then, that for many American diners, the quintessential Ethiopian restaurant dish is the vegetarian sampler — even if novices would be hard-pressed to name the assorted individual stews and sautés that comprise it. Enssaro's four-item vegetarian sampler didn't quite soar to the heights of a stellar version that I enjoyed recently at Injera in Alameda: The kik alicha (yellow split pea stew) and messer wot (red lentil stew) were more muted in their flavors than I would have preferred. But the ata-kilt — a stew of soft-cooked potatoes, carrots, and cabbage — was notable for how the sweet cabbage leaves had retained their crispness. And the highlight, by far, was what was probably the most flavorful and buttery version of gomen, i.e., sautéed collard greens, I've ever eaten. It was so tasty when scooped up with the spongy, tangy injera bread that accompanied the meal that I'll probably just get a full order instead of the sampler next time. 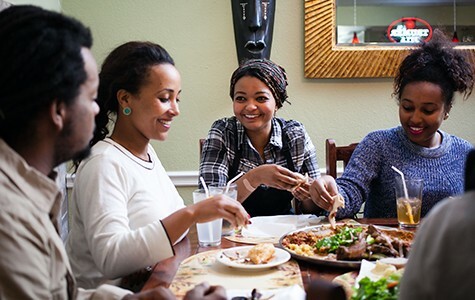 The restaurant also allows diners to create their own mix-and-match samplers of both meat and vegetarian dishes — an option that's a boon to solo diners, who tend to get the short end of the stick with Ethiopian menus constructed with family-style communal dining in mind. Enssaro's other notable vegetarian dish is the buticha, aka "Ethiopian hummus" — a chickpea dip that's offered as an appetizer. This consisted of three pale-yellow scoops of what looked an awful lot like potato salad but turned out to be a cold mixture of chickpea flour, olive oil, garlic, and serrano chilies, which gave the spread a nice, addictive kick. Meanwhile, I enjoyed the stretchy, flaky pastry wrappers and the well-seasoned beef filling of the fried sambusas — Ethiopia's variant on a samosa-like meat or vegetable pocket. With all the attention that the cuisine gets for its vegetarian dishes, it's easy to forget how much Ethiopians love meat — and beef, in particular. And where Enssaro really stands apart is with these lesser-known meat dishes. The best was the bozena shiro, a beefy variant on shiro, a reddish-orange, deeply savory chickpea flour stew that you'll find at every Ethiopian restaurant. Harder to find is Enssaro's version, wherein a quick stir-fry of seasoned ground beef is added to the stew at the last minute. The extra bit of texture and meaty flavor was surprisingly addictive — not far removed from the pleasures of an extra-sloppy sloppy joe. Enssaro also serves a respectable version of gored gored — large cubes of very lean, entirely raw beef eye round tossed in awaze (a red hot sauce), mitmita (a traditional spice blend), and seasoned clarified butter. The dish is a not-so-distant cousin of kitfo, aka Ethiopian beef tartare, and differs mainly just in the fact that the beef isn't minced. In Enssaro's version, the flavors were spot-on, but be warned: The large pieces of beef were tough enough to present a choking hazard for diners who don't chew carefully. Much better was the lamb derek tibs, a dish I rarely see on East Bay Ethiopian menus — and one of the few "dry," unsauced dishes on the menu. If there's such a thing as Ethiopian barbecue, this is it: thin strips of leg meat griddled in a hot skillet until the edges turn crispy, tossed with slivers of nicely caramelized red onion. The crowning touch was a couple of gamey, full-flavored lamb ribs. We wound up ripping the skin, fat, and flesh off the bone with our teeth and bare hands. Many of these dishes also make for great drinking food, so it's nice that the new Enssaro has a greatly expanded booze selection — not just honey wine and craft beer on tap, but also several Ethiopian bottled beers. Anyway, I can't say with any confidence that Enssaro owes its popularity to the quality of its somewhat obscure meat dishes. And figuring out why one restaurant gains a massive following when others (that are perhaps equally good) never do still seems more like art than science. Clearly, though, it helps when your food, at the end of the day, lives up to the hype. Correction: In the original version of this story, we misspelled the name of the restaurant as "Ensarro." The correct spelling is "Enssaro."